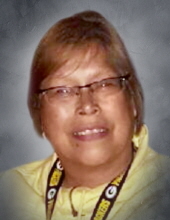 Tina D. Metoxen, 55, Oneida, passed away with family by her side on Tuesday evening, March 19, 2019. The daughter of Ronald and Yvone (Denny) Metoxen was born on January 10, 1964 in Milwaukee. The oldest of five children, Tina grew up in Milwaukee and graduated from South Division High School. She enjoyed playing volleyball and took pride in serving the youth at the American Indian Council on Alcoholism in Milwaukee. For many years, Tina was a table games manager at the Oneida Casino. She loved to host card games and board games with friends. Unfortunately, she could never beat her son Larry in cribbage. More than anything, Tina loved spending time with her family. She was a strong single mother to Celisha and Larry, and helped in raising her grandkids as well. Her favorite moments were taking them out to eat, shopping and watching movies. Her grandkids meant the world to her. Tina is survived by her parents, Ronald and Yvone; children Celisha and Larry; grandchildren Taylor, Hyson, Isaac, Janessa and Naquilo. She is further survived by her siblings, Barry, Shannon (Leigh Ann), and Sakesha (Jim); as well as her special nieces and nephews, Mariah, McKenna, Triston, Takoda and Cal. She was preceded in death by her brother, Brian. Family and friends may visit at Holy Apostles Episcopal Church, 2937 Freedom Road, Oneida, beginning at 9:00 a.m. on Saturday, March 23, 2019. The Oneida Hymn Singers will sing at 10:00 a.m., and the Funeral Mass will begin at 10:30 a.m. with Vicar Rodger Patience officiating. Burial will follow at the Oneida Sacred Burial Grounds. The family would like to extend their thanks to the St. Vincent Hospital 6th Floor ICU doctors, nurses and staff for the wonderful care you given. Tina, you’re as free as a bird now. To send flowers or a remembrance gift to the family of Tina D. Metoxen, please visit our Tribute Store. "Email Address" would like to share the life celebration of Tina D. Metoxen. Click on the "link" to go to share a favorite memory or leave a condolence message for the family.